See more concerts in the San Francisco area. Comments: U2's stop in San Jose marks the first city this tour to get two shows. The band returns to the SAP Center, the same venue they played on the I+E tour almost three years ago to the date.As was the case in St. Louis, some sections on the upper level behind the stage are blocked off by curtains. As part of its afternoon soundcheck, the band rehearses "Red Flag Day," which hasn't been played live yet -- and still doesn't get played tonight. Soon after, U2 gives "Gloria" its tour debut. The song had been practiced during some of the pre-tour rehearsals, but had yet to be played. It's the sixth song of the night, the same spot occupied three nights ago in St. Louis by "New Year's Day" -- making it look like that's a spot where the band will rotate classic songs from its early career. It's the first performance of "Gloria" since the final days of the I+E tour -- November 27, 2015, in Dublin. In the second half of the show, Bono continues to tweak his MacPhisto speech before "Acrobat." Tonight's includes references to the California highways, Silicon Valley/tech and even a Vladimir Putin reference -- "my own protege," MacPhisto calls him. 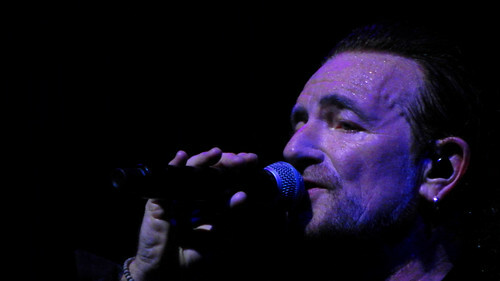 Bono also sneaks in a snippet of "Landlady" before "You're The Best Thing About Me." That's the first time "Landlady" has been performed live in any measure. At the conclusion of the show, the Talking Heads song "This Must Be The Place" plays over the PA system, replacing the usual outro song, "The Miracle (Of Joey Ramone)." We have 1 reviews and 3 photos from this show.